FOR THE RECORD, there is no Whitefish Yacht Club. But if there were, Rob and Chris Schumacher would be its ambassadors. 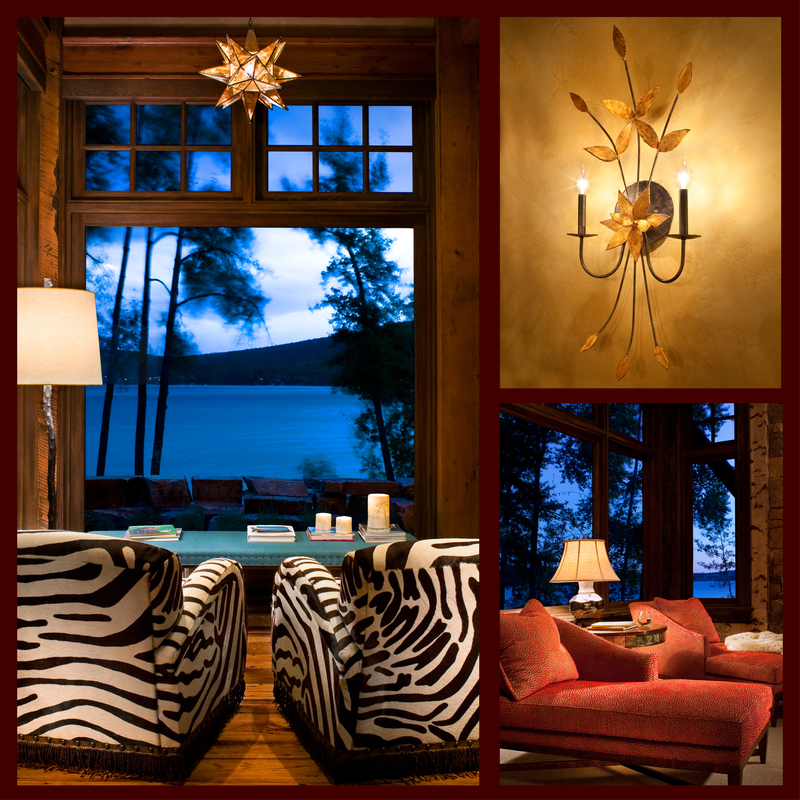 The Schumachers were drawn to Whitefish for the lakeside living. They built a home centered around that easy pace of summer on the water where that means a swim before breakfast and waterskiing at midnight under the full moon. With them they brought a spirit of fun that infuses their house and the friendships that extend from time spent enjoying Montana together. “When we came up to Whitefish I was surprised there were no sail boats let alone a yacht club — apparently it’s not very windy but when it is, it really blows,” explains Rob, who grew up in the San Francisco Bay area sailing out of the St. Francis Yacht Club and later in college from Marina del Rey. “So I bought a small racing sail boat and thought it would be a great spoof to start the Whitefish Yacht Club and also become its Commodore.” In the last decade he has handed out 200 Whitefish Yacht Club hats and other paraphernalia, admitting, tongue in cheek, it’s very fun to be called the Commodore. That playfulness extends to the way their home seamlessly connects indoor-outdoor living. Upon walking through the front door the first view is the lake. From its sloped lot the house cascades down to the water, with expansive windows, open floor plan in the main living area, a patio that spills out from the kitchen, down toward the fire pit, a big yard replete with trampoline for the kids and ultimately down to the dock.Designed by Locati Architects and built by Casey Malmquist of Malmquist Construction, the house flows in a way that makes the lake ever-present. From the art collection to the blue elements, which define the interior design color palette, the theme of water is predominant. “We really try to pull the inside out and the outside in so that you feel like you are part of your surroundings,” says Jerry Locati principal of Locati Architects. Locati’s firm, based in Bozeman, has cultivated a reputation for architectural design that doesn’t stop at the front door, but encompasses the whole site. 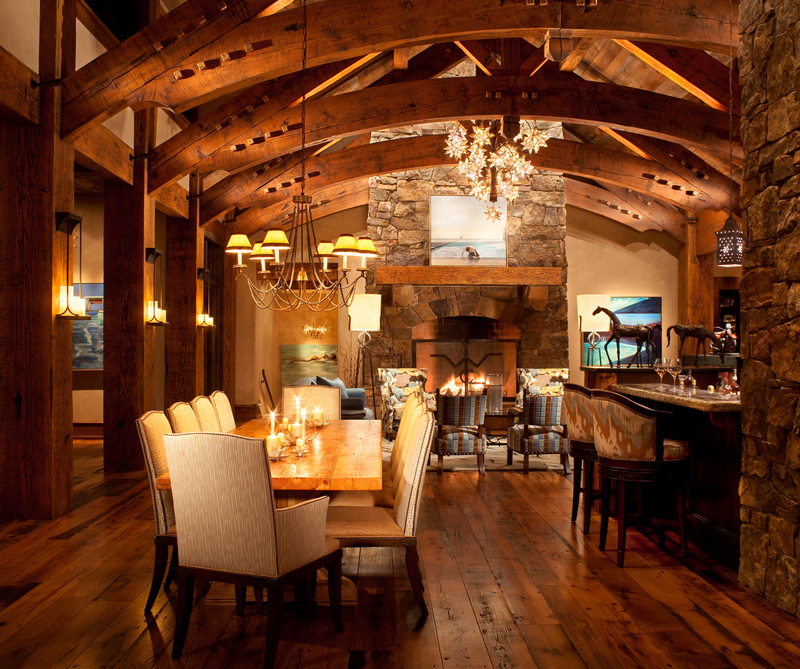 At the Schumacher residence, that translates to a traditional rustic stone and timber design that resonates with the homeowners’ longtime connection to Lake Tahoe and recent love affair with Montana mountain culture. Attracted to Whitefish for the friendly atmosphere (“We’ve made lifelong friends on the lake,” says Rob.) and the location — a lake ideal for water skiing and warm enough to swim in any time of the summer, incredible winter skiing at Whitefish Mountain and great golfing nearby — topped with a quaint mountain town that boasts fine restaurants and airport to make all of it accessible from California within two hours (a much shorter commute than a trip to Lake Tahoe). To get that effect, Locati Architects created large, open spaces for gathering family and friends, with careful attention to managing the scale of those larger spaces with timbers and other structural elements to keep the feel warm, friendly and interactive, keeping the family dynamic and fun as the driving forces of the design. “We took architectural elements from Montana vernacular, Adirondack summer camps, mountain lodges, and kind of stirred the pot with all of them to create a new twist on what is possible lakeside at Whitefish,” explains project architect and partner, Greg Dennee, of Locati Architects. Interior designer, Hunter Dominick, of Hunter & Co. in Whitefish took some risks in interpreting the Schumachers’ vision of their home and completing the design package. The result is a home that embodies a sense of high style with the practicality of comfort for an active family. Most significantly, custom lighting defines spaces uniquely and stands out as sculptural statement pieces throughout the home. In the kitchen, for instance Hunter & Co. placed a branch-chandelier, handcrafted by a Brazilian artist; it elevates the design of the kitchen, which links to an outdoor dining area. The Schumachers trusted Hunter entirely and did not balk at her application of the wilder zebra-print chairs in a sitting area that overlooks the lake (Officially, Rob’s favorite nook for reading. ), nor the handmade silk rug in the living room where colored fish swim serenely. Each room displays a distinct custom feature, from the starlight chandelier in the living room to the hand-applied birch bark that lines the walls of the master suite and even more so to the theater, where the blue element continues in the giraffe-print bean bags and cozy blue couches. Acknowledging every detail, Hunter & Co. selected every fixture, furnishing and finish, right down to the linens and silverware. She granted their wish to elevate the traditional home with contemporary style that suited their tastes. Left: A nook in the wine room provides a casual tasting area. • Center: Extending the living space to an outdoor room that connects to the kitchen is where most mornings begin and evenings culminate after a day spent on Whitefish Lake. • Right: Malmquist Construction continued the exposed trussing from the main house to the exterior. Hunter and Co. interior design responded to the homeowners’ desire to blend high style with casual living. 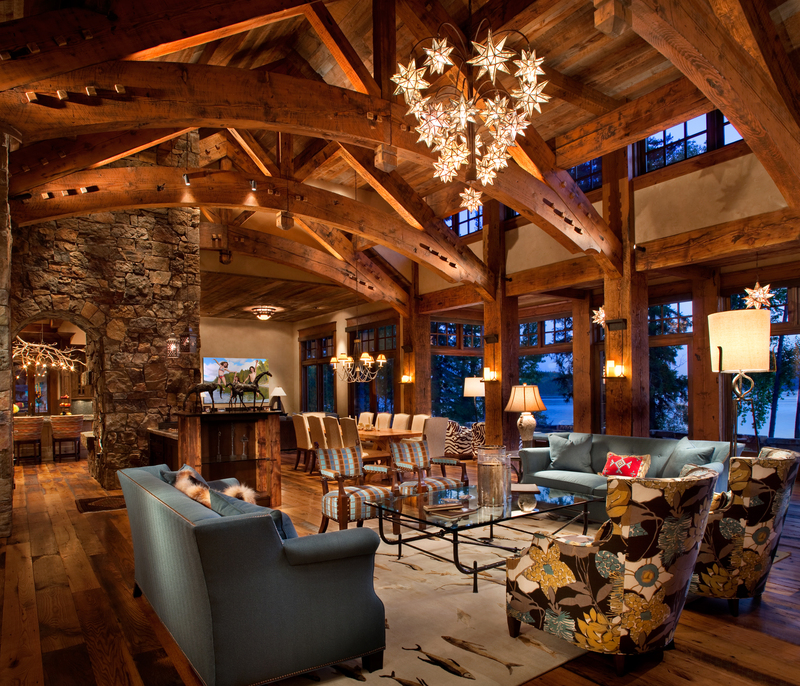 Custom lighting, contemporary upholstery and clean lines complement the rustic timbers in the great room. Incorporating a contemporary art collection with a water theme was a crucial inspiration for the interior design in the home. Above the mantel, Gregg Chadwick’s painting “The Pale Hour” brings a serene tone to the room and on the left “Parkers Pool” is by Greg Miller. 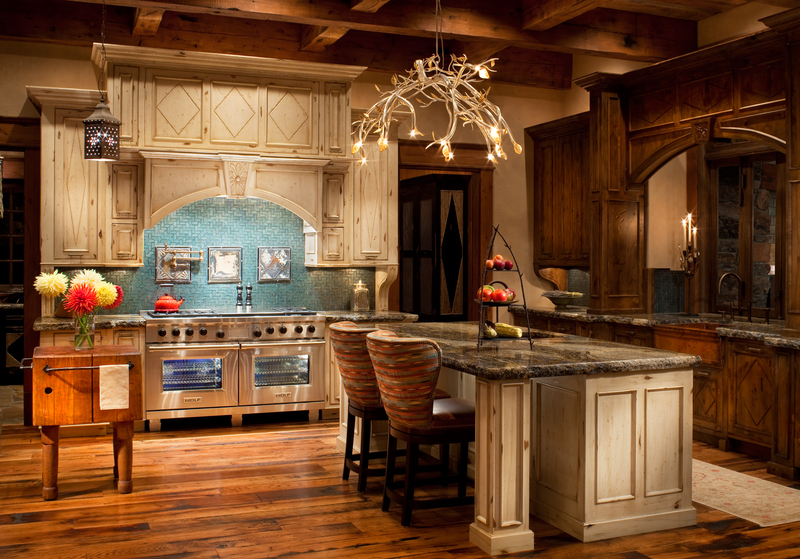 In the open kitchen a branch chandelier made by a Brazilian artist adds a sculptural element to the room. The blue glass tile backsplash links with the interior color palette. 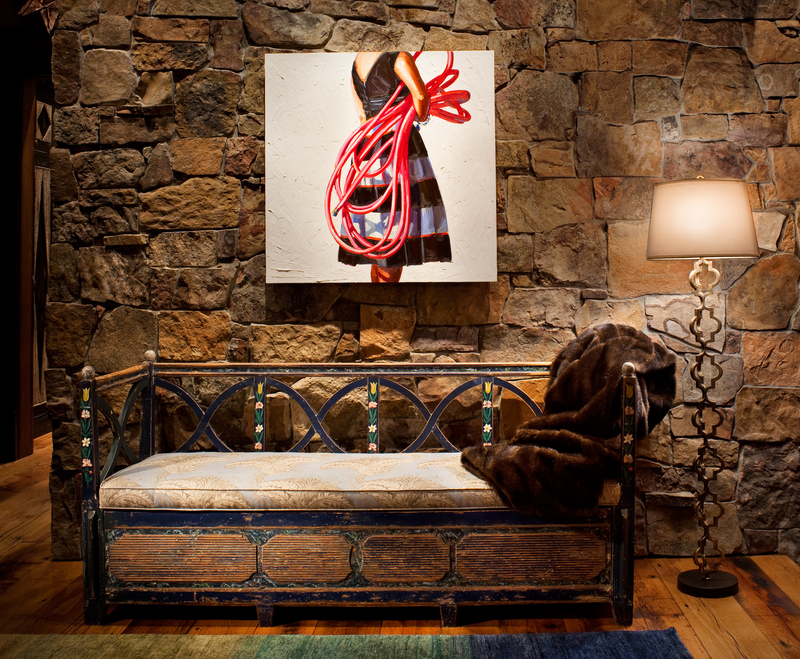 Essential art pieces set the tone for the contemporary style throughout the house. This oil on panel in the entryway, entitled “Pink Hose” by Kelly Reemstsen is a subtle nod to the water theme in the art collection.